Inorganic vs Organic Selenium. 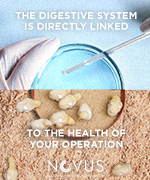 Dietary selenium (Se) supplemented in the form of organic Se from Se yeast, also called selenized yeast, has higher bioavailability than Se from sodium selenite. Many metabolic functions may be enhanced throughout the body simply by delivery of more selenium to the bloodstream. Se yeast also provides modified amino acids seleno-cysteine and seleno-methionine which may have specific beneficial effects on metabolism as well. Plasma glutathione peroxidase contains an integral and stoichiometric quantity of Se, and serves a natural antioxidant function (Rotruck et al., 1973), along with vitamin E and ascorbic acid (vitamin C). Without this protection, Se-deficient pigs may go into a proxidant shock after iron injections and die. Se improves immune status because several indicators of immunocompetence and immune respons-iveness are depressed in Se deficiency (Latshaw, 1991). Some widely used veterinary pharmaceuticals may cause increased demands for metabolic functions which involve Se (Combs, 1980). Se is also necessary for deiodinase activity to convert thyroxine (T4) into triiodothy-ronine (T3) which regulates basal metabolic rate of cells throughout the body (Jianhua et al., 2000). Awadeh et al. (1998) reported that sodium selenite or Se yeast providing 60 ppm Se to free-choice salt increased plasma T3 by 14% in beef cows compared to 20 ppm Se from sodium selenite. Se yeast contributing 60 ppm Se to salt increased plasma T3 in calves at birth by 56% and 77% compared to the 20 and 60 ppm Se from sodium selenite treatments, respectively (5.3 vs 3.4 and 3.0 ng/mL). several selenium deficiency symptoms such as impaired reproduction, prolonged farrowing, lactation failure, poor immune responses, nutritional muscular dystrophy, mulberry heart disease, and reduced pig performance. Mahan et al. (1999) found that tissue Se contents increased linearly as the dietary Se level increased, but the increase was markedly higher when organic Se was fed to growing-finishing pigs. Additionally, there was a trend for higher drip loss (P = 0.11) and a linear increase in loin paleness when the inorganic Se (sodium selenite) level increased (P < 0.01), apparently due to sodium selenite's proxidant activities. Kim and Mahan (2001a) showed that Se at > or = 10 ppm from sodium selenite was toxic to growing-finishing pigs, causing hair loss (alopecia) and separation of the hoof at the coronary band site, whereas > or = 15 ppm from organic Se was required for similar responses. However, plasma and blood cell Se contents were higher when the organic Se was used compared to sodium selenite at similar dietary Se levels (P < 0.05). Therefore, at equal dietary Se inclusion rates, organic Se contributes higher levels of Se to the circulation than sodium selenite and yet is less toxic when overdosed. In the Alltech, Inc. 30 June 2005 dossier for registration of Sel-Plex® selenized yeast in the European Union, the following significant effects on sows for reproduction and on sows for benefits in piglets were demonstrated: 1) increased Se transfer in milk and colostrum, 2) increased total Se in edible tissue (loin, kidney, etc. ), 3) decreased back fat, and 4) decreased Se in feces and urine. 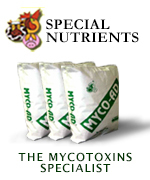 No adverse effects of Se yeast have been found in piglets given 10 times the maximum dose. Sow Trials with Selenium Yeast. 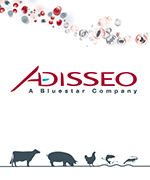 Dietary organic selenium in the form of Se yeast (Sel-Plex®) for gestating and lactating sows has been evaluated in a number of trials. Mahan and Kim (1996) fed diets with 0.1 or 0.3 ppm Se from sodium selenite or Se yeast beginning about 60 days before breeding to gilts to end of lactation (weaning of piglets). Milk Se increased, loin Se of neonatal and stillborn piglets increased, and serum and loin Se of weanling piglets increased as dietary Se level increased or when Se yeast was fed. Mahan (2000) added 0, 0.15, or 0.30 ppm Se from either sodium selenite or Se yeast to sow diets for 6 days prepartum through 14 days of lactation. Short-term feeding of Se yeast, but not sodium selenite, increased Se content of colostrum. Milk Se at 7 and 14 days postpartum was 2.5 to 3 times higher when Se yeast was fed compared to inorganic Se so organic Se was more effectively incorporated into milk. tissue Se and seum Se concentrations increased as dietary Se level increased or when Se was fed. Mahan and Peters (2004) started gilts at 27.6 kg body weight on diets with 0, 0.15, or 0.30 ppm Se from sodium selenite or Se yeast and continued treatments through a reproductive cycle. Tissue and total body Se contents of newborn pigs from 4-parity sows increased with increasing dietary Se level or with organic Se (P < 0.01). Colostrum and milk Se concentrations were subtantially greater in Se yeast fed treatments (P < 0.01). Sow tissue Se levels were higher when fed Se yeast rather than sodium selenite (P < 0.01). Lampe et al. (2005a, 2005b) reported results of feeding 0.3 ppm Se from sodium selenite or Se yeast to sows from 80 days of gestation through lactation. Litter data was analyzed from about 380 sows per treatment, and results are presented in Table 1 (Trial 1). All litters were equalized to same number of piglets on day of birth. Mid-lactation milk Se was greater in the Se yeast group. Sows receiving Se yeast weaned significantly more pigs (P = 0.001) by 0.35 pigs/litter and had higher litter weaning weights (P = 0.01) by 4.6 lb at 0.6 days younger than those receiving sodium selenite. Piglets deaths/sow (equalized litters basis) was reduced by Se yeast supplementation (P = 0.06). During the nursery phase of Trial 1, pigs from each sow treatment were fed 0.3 ppm Se from either sodium selenite or Se yeast (2 x 2 factorial). An influence of sow Se source was observed for total pig mortality plus culls in the nursery phase, 96.8% from sows fed Se yeast and 94.6% from sows fed sodium selenite (P = 0.10; main effect). Unpublished results of sow Trial 2 by these researchers are presented in Table 1. A level of 0.3 ppm Se from sodium selenite was added to diets of 378 sows, or from Se yeast to diets of 516 sows, beginning at 72 to 79 days of gestation. There were trends for a greater number of pigs born alive (P > 0.08) and for a reduction in piglet deaths/sow with equalized litters (P < 0.14) when sows received Se yeast in their diets. No pig body weights were taken at birth or weaning in Trial 2. There were no significant differences due to treatments; however, pigs weaned was slightly numerically higher (9.55 vs 9.42) and preweaning mortality % was lower (12.6 vs 15.5) for pigs from sows receiving Se yeast compared to sodium selenite. yeast was supplemented to sow diets, there was a significant decrease in piglet deaths/sow by 0.15 pigs (P < 0.02) and in weaning age (P < 0.01) by 0.27 days, and an increase in the number of pigs weaned/litter (P < 0.01) by 0.22 pigs. Economic Implications of Fewer Piglet Deaths/Litter. The economic benefit of weaning an average additional 0.15 pig/litter (or that many fewer deaths/equalized litter) can be calculated under today’s conditions. Assuming 2.25 litters, 2.25 x 0.15 pigs/litter gives 0.34 more pigs/sow/year. If the weaned pig is worth about $30, then 0.34 pigs x $30 gives $10.20/sow extra revenue. At current costs, feeding Se yeast continually for a year shows an average return on investment of about 7:1 and a reduction in sow feed cost/piglet weaned. Two sow feeding trials were conducted at a commercial facility with diets containing 0.3 ppm added Se from either sodium selenite or Se yeast, fed beginning	at 72 to 80 days of gestation through lactation. In one trial pig birth and weaning weights were also recorded. In Trial 1 and Combined Trials dietary Se yeast significantly increased the overall number of pigs weaned per litter (+0.22 pigs for Combined Trials). Piglet deaths/sow in equalized litters were significantly reduced by 0.15 pigs for Combined Trials, and this advantage alone provides an estimated 7:1 benefit to cost ratio or return on investment. Litter weaning weight, measured in Trial 1, was significantly improved by +4.6 lb using sow diets with Se yeast compared to diets with sodium selenite. Litter weaning weight reflected improvements in weaned pig numbers and body weights. Sows fed Se yeast containing diets produced piglets with 2.2% lower preweaning mortality. Therefore, Se yeast is recommended as a replacement supplement for sodium selenite in sow gestation and lactation feeds from at least 72-80 days of gestation, and preferably over the entire reproductive cycle, to improve pig numbers, body weight, and livability. 2Calculated as ([1-(total pigs weaned/total pigs born alive)] x 100). Mortalities included pigs laid on, those with low viability, etc. 3Includes days for gilts that were skipped first service, following weaning, and bred on second heat. Awadeh, F. T., R. L. Kincaid, and K. A. Johnson. Effect of level and source of dietary selenium on concentrations of thyroid hormones and immunoglobulins in beef cows and calves. J. Anim. Sci. 76:1204-1215. Combs, G. F. Jr. 1980. The search for the nutritional role of selenium: A success story in poultry nutrition. Feed Management 31(1):38-39. Jianhua, H., A. Ohtsuka, and K. Hayashi. 2000. Selenium influences growth via thyroid hormone status in broiler chickens. Brit. J. Nutr. 84(5):727-732. Kim, Y. Y., and D. C. Mahan. 2001a. Comparative effects of high dietary levels of organic and inorganic selenium on selenium toxicity of growing-finishing pigs. J. Anim. Sci. 79(4):942-948. Kim, Y. Y., and D. C. Mahan. 2001b. Prolonged feeding of high dietary levels of organic and inorganic selenium to gilts from 25 kg body weight through one parity. J. Anim. Sci. 79(4):956-966. Sel-Plex® versus sodium selenite as selenium sources in sow diets. J. Anim. Sci. 83 (Suppl. 2):81. Lampe, J., G. Gourley, J. Sparks, and T. Stumpf. 2005b. Prewean piglet survivability: Sel-Plex® versus sodium selenite as selenium sources in sow and nursery phase diets. J. Anim. Sci. 83 (Suppl. 2):81. Latshaw, J. D. 1991. Nutrition -- mechanisms of immunosuppression. Vet. Immunol. Immunopathol. 30(1):111-120.Mahan, D. C. 2000. Effect of organic and inorganic selenium sources and levels on sow colostrum and milk selenium content. J. Anim. Sci. 78(1):100-105. Mahan, D. C., and Y. Y. Kim. 1996. Effect of inorganic or organic selenium at two dietary levels on reproductive performance and tissue selenium concentration in first-parity gilts and their progeny. J. Anim. Sci. 74(11):2711-2718. Mahan, D. C., J. H. Brendemuhl, S. D. Carter, L. I. Chiba, T. D. Crenshaw, G. L. Cromwell, C. R. Dove, A. F. Harper, G. M. Hill, G. R. Hollis, S. W. Kim, M. D. Lindemann, C. V. Maxwell, P. S. Miller, J. L. Nelssen, B. T. Richert, L. L. Southern, T. S. Stahly, H. H. Stein, E. van Heugten, Y. T. Yen. 2005. Comparison of dietary selenium fed to grower-finisher pigs from various regions of the United States on the resulting tissue Se and loin mineral concentrations. J. Anim. Sci. 83(4):852-857. Mahan, D. C., T. R. Cline, and B. Richert. 1999. Effects of dietary levels of selenium-enriched yeast and sodium selenite as selenium sources fed to growing-finishing pigs on performance, tissue selenium, serum glutathione peroxidase activity, carcass characteristics, and loin quality. J. Anim. Sci. 77(8):2172-2179. Rotruck, J. T., A. L. Pope, H. E. Ganther, A. B. Swanson, D. G. Hafeman, and W. G. Hoekstra. 1973. Selenium: Biochemical role as a component of glutathione peroxidase. Science 179:588-590. Surai, P. F. 2006. Selenium in Nutrition and Health. Nottingham University Press, Nottingham, U.K., pp. 445-486.